Aris Spanos, my colleague (in economics) and co-author, came across this anonymous review of our Error and Inference (2010) [E & I]. 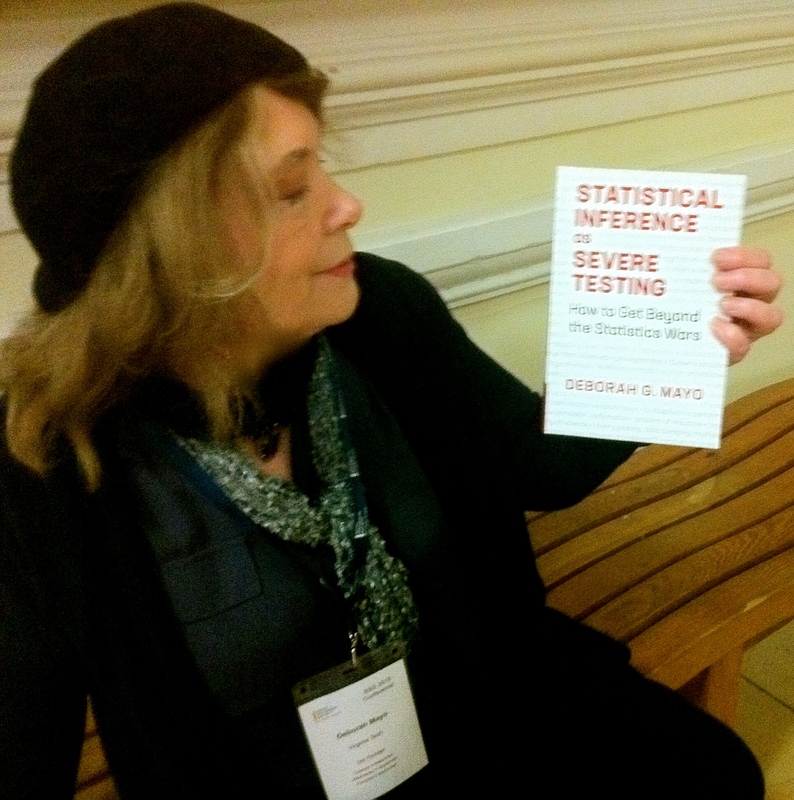 Interestingly, the reviewer remarks that “The book gives a sense of security regarding the future of statistical science and its importance in many walks of life.” We’re not sure what the reviewer means–but it’s appreciated regardless. This post was from yesterday’s 3-year memory lane and was first posted here. TECHNOMETRICS, AUGUST 2010, VOL. 52, NO. 3, Book Reviews, 52:3, pp. 362-370. Error and Inference: Recent Exchanges on Experimental Reasoning, Reliability, and the Objectivity and Rationality of Science, edited by Deborah G. MAYO and Aris SPANOS, New York: Cambridge University Press, 2010, ISBN 978-0-521-88008-4, xvii+419 pp., $60.00. This edited volume contemplates the interests of both scientists and philosophers regarding gathering reliable information about the problem/question at hand in the presence of error, uncertainty, and with limited data information. The volume makes a signiﬁcant contribution in bridging the gap between scientiﬁc practice and the philosophy of science. The main contribution of this volume pertains to issues of error and inference, and showcases intriguing discussions on statistical testing and providing alternative strategy to Bayesian inference. In words, it provides cumulative information towards the philosophical and methodological issues of scientiﬁc inquiry at large. The target audience of this volume is quite general and open to a broad readership. With some reasonable knowledge of probability theory and statistical science, one can get the maximum beneﬁt from most of the chapters of the volume. The volume contains original and fascinating articles by eminent scholars (nine, including the editors) who range from names in statistical science to philosophy, including D. R. Cox, a name well known to statisticians. In summary, this volume contains a wealth of knowledge and fascinating debates on a host of important and controversial topics equally important to the philosophy of science and scientiﬁc practice. This is a must-read—I enjoyed reading it and I am sure you will too! The book gives a sense of security regarding the future of statistical science and its importance in many walks of life. I also want to take the opportunity to suggest another seemingly related book by Harman and Kulkarni (2007). The review of this book was appeared in Technometricsin May 2008 (Ahmed 2008). The following are chapters in E & I (2010) written by Mayo and/or Spanos, if you’re interested. If you produce a palindrome meeting the extremely simple requirements for May (by June 4, midnight), you can win a free copy! Cox D. R. and Mayo. D. G. (2010). “Objectivity and Conditionality in Frequentist Inference” in Error and Inference: 276-304. Mayo, D. G. (2010). “An Error in the Argument from Conditionality and Sufficiency to the Likelihood Principle” in Error and Inference: 305-14. Mayo, D. (2010). “Error, Severe Testing, and the Growth of Theoretical Knowledge” in Error and Inference: 28-57. Mayo, D. (2010). “Can Scientific Theories be Warranted with Severity? Exchanges with Alan Chalmers” in Error and Inference: 73-87. Mayo, D. (2010). “Towards Progressive Critical Rationalism: Exchanges with Alan Musgrave” in Error and Inference: 115-124. Mayo, D. (2010). “An Ad Hoc Save of a Theory of Adhocness? Exchanges with John Worrall” in Error and Inference: 55-169. Mayo, D. (2010). “Sins of the Epistemic Probabilist: Exchanges with Peter Achinstein” in Error and Inference: 189-201. Mayo, D. (2010). “Explanation and Testing: Exchanges with Clark Glymour” in Error and Inference: 351-363. Mayo, D. (2010). “Error and the Law: Exchanges with Larry Laudan” in Error and Inference: 397-409. Mayo, D. G. and Cox, D. R. (2010). “Frequentist Statistics as a Theory of Inductive Inference” in Error and Inference: 247-275. Mayo, D. and Spanos, A. (2010). 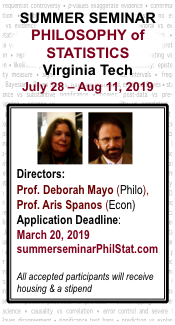 “Introduction and Background: Part I: Central Goals, Themes, and Questions; Part II The Error-Statistical Philosophy” in Error and Inference: 1-14, 15-27. Spanos, A. (2010). Theory Testing in Economics and the Error-Statistical Perspective in Error and Inference: 202-246. Spanos, A. (2010). On a New Philosophy of Frequentist Inference Exchanges with David Cox and Deborah G. Mayo in Error and Inference: 325-330. Spanos, A. (2010). Graphical Causal Modeling ad Error Statistics Exchanges with Clark Glymour in Error and Inference: 364-375. I couldn’t have said it better myself. This review of “Error and Inference” in Technometrics really does capture the spirit of the book. When I tell people of the importance of the philosophical work Mayo, Spanos and colleagues are doing here, I know I’m not talking nonsense when reviews such as this show up. Mayo’s forthcoming book will garner no less praise. Steven: You’re a prince, and I assure you that it means a lot to get your approval! Thank you!